Is that a Sharknado forming on the album’s cover? Full Circle is the second studio album, and third overall, from the Terry Ilous-fronted version of Great White. If you’re looking for the other version of Great White, fronted by original vocalist Jack Russell, my review of their debut album, He Saw It Comin’, can be found here. The album’s title is a reference to the band reconvening with producer Michael Wagener, who produced the band’s self-titled LP all the way back in 1984. Wagener has produced/mixed for the likes of Metallica, Ozzy, Megadeth, Motley Crue, Dokken, Accept, Alice Cooper, etc. There’s no doubt that snatching up Michael Wagener was a big score for the band and added a little extra credibility to this release at a time when their former leader singer released his own Great White album this year. It’s hard not to compare this release to He Saw It Comin’. Both albums have their positives and negatives. Full Circle is a more consistent listen. There are no curve balls here and no songs where they experiment with new sounds or genres. On the flip-side, you have a Great White album without Jack Russell’s signature vocals, which is still weird to me. Full Circle is a marked improvement over Elation, and ultimately, I enjoy both this album and the Jack Russell’s Great White release. Stand outs are the opening rocker “I’m Alright” and moody “Cry of a Nation”, which sounds like something the band would’ve pulled off in the late ’80s/early ’90s. Recorded at L.A.’s legendary Key Club on March 22, 2012, this is the band’s fourth, fifth or sixth live album..? Who knows! Hey, I can’t keep up with all of their live releases because a number of them have been repackaged & re-titled over the years. 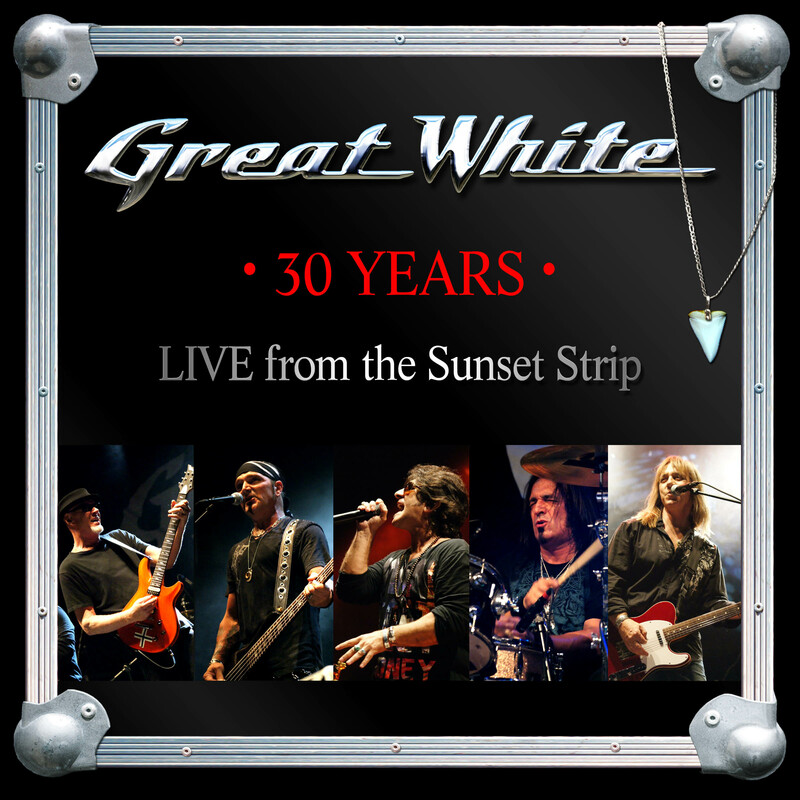 I do know that this is Great White’s first live offering featuring former XYZ singer Terry Ilous as the frontman. This is basically a live greatest hits. Though I’m a little surprised that they included “Back to the Rhythm” from 2007’s Back to the Rhythm album but didn’t include anything from 2009’s Rising. I would’ve assumed that they would have focused on their ’80s/early ’90s material entirely anyway. The absence of Elation material is somewhat understandable because that album wasn’t released until May 2012. Although Jack Russell was much missed on Elation, I think Terry does a great job handling some of the band’s classics in a live setting. I still pick up that Jack Russell/Steven Tyler vibe from his vocals and while Jack Russell will always be THE voice of Great White, I can’t knock Terry Ilous’ abilities at all. With the departure of Jack Russell, I think Terry was a great choice for lead singer and 30 Years: Live from the Sunset Strip further proves it. The production on this album isn’t great but it’s fine considering the budget probably was pretty tight. I’ve heard a lot worse. The crowd seems a bit low-key at times but I guess you can chalk that up to the production and the fact that it’s a club audience. And say what you will about Terry Ilous, the band is on fire. Sometimes you hear a band live and they don’t come close to replicating the work they did in the studio but Great White is a real band that cut their teeth playing dives & bars in the early years. They’ve got the chops to back up what they put on tape. Although I’m generally not a fan of live albums, 30 Years is a good snapshot of the Terry Ilous-front Great White. There is one ingredient that’s missing from this album and it’s a very noticeable ingredient. Jack Russell, one of my favorite rock vocalists, is no longer a member of Great White. Well, he’s not a member of this particular version at least. Long story short, Russell now has a band called “Jack Russell’s Great White” while Great White has acquired the services of XYZ singer Terry Ilous. It’s another L.A. Guns situation. We’ve got two bands using the same name, playing the same songs to the same niche audience and taking shots at each other in the press. Hopefully this won’t go on for too long because unlike the L.A. Guns situation, lawyers are involved and it would be nice for Russell and Great White to put this ugly incident behind them. 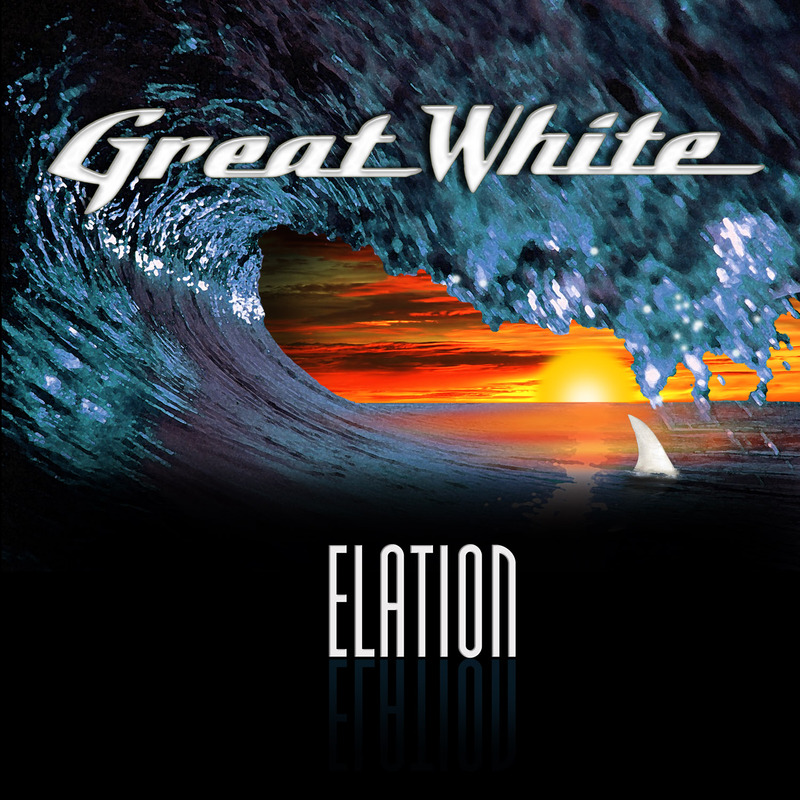 As far as I’m concerned this band that has just released Elation is the real Great White. I’d love and would prefer Jack back in the band, I have nothing against Russell, I’m actually looking forward to any new music his new group can put out but this is the deal real just like I think the Phil Lewis version of L.A. Guns is the only legit version of LAG. Time will tell which band is superior but I’ll be judging that based on new material only. So, yeah, Russell is out, Ilous is in and the difference is quite noticeable. That’s nothing against Ilous though. Terry is a great singer and has done a fine job no matter what band he’s in. XYZ has some great tunes but I will admit it’s hard to accept Great White without hearing Jack Russell. There are times when he’s doing his best to sound like Russell but on other songs he comes across like Jeff Keith from Tesla. Ilous is good on Elation, he’s just no Jack Russell. As for the music itself… It sounds like Great White to me. I know there were some complaints about Rising (which I liked a lot) being too laid back but I don’t think there should be too many complaints about Elation being soft. I felt Back to the Rhythm had some subtle modern moments but Elation gets back to basics with the band’s signature bluesy hard rock Led Zep-influenced sound. Yeah, there are some laid back moments, some slow burners, but that’s always been the Great White way. It’s not like they are playing acoustic rock. In comparison to the last two albums, I place Elation slightly below Back to the Rhythm and on par with Rising, but this is coming from a guy who enjoyed both of those albums and doesn’t think Great White has ever released a bad record. Sure, if Russell sang on this album it would’ve given Elation more impact but I think any Great White fan that truly listens to this album with an open mind will find it to be an enjoyable effort. Russell is so identifiable as the voice of Great White, I know having another singer in the band is a tough pill to swallow. This is not a classic, killer release but it is very good and it proves to me that the band is capable enough serve the Great White legacy well even without Jack Russell. Great White is one of those bands that has been cranking out solid albums for decades now, I haven’t heard a “bad” release from them yet. When you buy a Great White album, you have a pretty good idea of what you’re going to get because the band doesn’t change up their sound too much, other than some albums having more of a mellow vibe than others. It all still sounds like Great White though. This album in particular is one of their mellow releases, it doesn’t get as loud as Once Bitten… or …Twice Shy did, but there’s nothing here to complain about either. It’s a solid and respectable album, but its a low-key effort that I think is surpassed even by the band’s output from the 2000s. This was the last high-ranking album from the band. It debuted on the U.S. charts at #18 and eventually went gold, whereas …Twice Shy was double platinum. It’s easy to say “Oh, well, it was 1991, grunge was taking over, that’s why it didn’t do so well”, but the album was released in January ’91, nine months before Nirvana destroyed the hair metal genre. It was the lack of powerful single that damaged the band more than a changing musical climate. The band tried to replicate the success of their “Once Bitten, Twice Shy” cover with “Call It Rock N’ Roll”, but the chart-busting magic wasn’t there this time around and there’s nothing here on the level of “Rock Me”, “Save Your Love” or “The Angel Song” either. I had heard some rumblings that this album was fairly mellow and thus was disappointing a number of fans. It’s true Rising is not much of a hard rocker, but it doesn’t disappoint me at all. It’s less like Back to the Rhythm and more like Can’t Get There From Here, which is just fine by me because I think that was a great release. 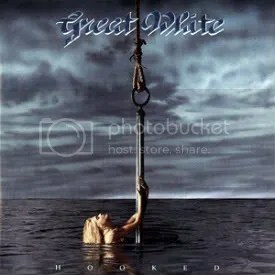 You have to face it though, Great White was *never* a heavy band to begin with, they’ve usually produce laid-back melodic rock albums and this one is just another in a long line of them. Great White just seems to be getting better and better with age. In fact, their last three albums are their best, I think. I expected Rising to be a decent album, but I didn’t expect it to be this good. I can’t imagine this album *not* making my Top 10 for the year. I also want to point out how cool the album art is. 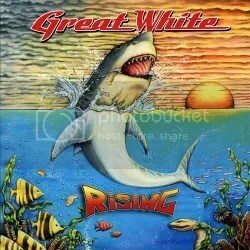 Great White usually has some wonderful artwork, but I’d put this cover right up at the top alongside Can’t Get There From Here‘s Lisa Frank-esque cover. I ended up ordering this album online after not being able to find it around town. I wasn’t surprised I couldn’t find it, but I’m pretty sure I picked up Back to the Rhythm in town when that was released. The very same day my copy arrived in the mail, I found out Walmart had been carrying it all along! D’oh! The first Great White album I owned was Can’t Get There From Here, but of course I had to step back in time and pick this one up years ago. Great White has never been flashy, just solid blues-influenced hard rock and Jack Russell has always been one of my favorite vocalists, so they deliver in their typical style here. The album is definitely a must own though for “Rock Me” and “Save Your Love” (which are my two favorite Great White songs). I have to say, I absolutely hate this cover. It (and the girl) look really cheap, she’s not very cute.